I noticed that Ann DeWitt has taken the time to respond to one of my recent posts about Entangled in Freedom [and here]. I will leave it to you to decipher her post. In addition, yesterday Hampton historian, Veronica Davis filed a lawsuit to halt the deletion of the controversial passage about black Confederates in the Virginia 4th grade history textbook. [Update: Brooks Simpson has included a link to Davis’s petition at Civil Warriors.] High profile African Americans, who have come to endorse this historical meme and for different reasons include H.K. Edgerton, Nelson Winbush and even Earl Ijames. One of my readers is convinced that Edgerton and other African Americans are being paid to promote this narrative. I couldn’t disagree more. In fact, I would suggest that such an explanation ignores an important aspect of this cultural phenomenon and our collective memory of the Civil War. I’ve been thinking a great deal about what the identification of some African Americans tells us about the evolution of Civil War Memory and while I don’t have any firm answers it might be worth posting for further discussion. Perhaps the identification with this narrative by some African Americans can be seen as evidence that black Americans have a deep need to connect with a Southern past. That should come as no surprise given the central role that they have played in its formation from the very beginning. At the same time that role has been decidedly influenced at different points in history by white Americans to buttress their own racial, cultural, and political agenda. One need look no further than the pervasiveness of an ideology of paternalism (in the context of slavery) during the antebellum period, the advent of the Lost Cause following the Civil War, and more recently a conscious effort to support white political control in the 1950s and 60s through the control of history textbooks. For many African Americans it is the Civil Rights Movement that looms large as a place to find heroic stories, larger-than-life personalities, and even narratives of racial reconciliation. The Civil War, on the other hand, has been lost. As I’ve learned over the years many African American families pushed their history of slavery away either because it was too painful or the narrative had been reduced to one of degradation and misery. The past few decades has witnessed a dramatic shift in the way that slavery is interpreted as well as the reemergence of African American participation in the war itself – seen most clearly in the 1989 release of “Glory.” The movie’s success in its appeal to a mainstream white audience ought to be seen as an important milestone in the evolution of popular memory of the war that has come to acknowledge the central role of slavery and emancipation in the overall conflict. The interest in black Confederates among some African Americans may simply come to a desire to broaden the focus to include even more stories of black manliness and heroics, regardless of historical truth. It is understandable than that some may be defensive about what they perceive as an attack on their rightful place at the center of the historical narrative. On the other hand, the appeal of these stories may come down to wanting to feel connected to a particular time and place, which is a desire that “Glory” does not satisfy. Consider the case of Weary Clyburn, who was present with the Confederate army as a slave, but was recently honored by the Sons of Confederate Veterans as a soldier. 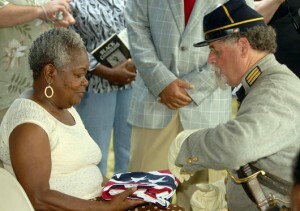 Clyburn’s descendants were also honored during the ceremony. It must have been an incredibly emotional experience for this family to be welcomed by an organization that has chosen to single out an ancestor for his strict adherence to a code of martial values. Finally, these stories offer an avenue of racial reconciliation. You can see this in the Clyburn video and there is clearly a strong reconciliationist streak in the confused writings of Ann DeWitt. In fact, it is so strong that DeWitt cannot help but interpret a challenge to her historical method as an attempt to further the racial divide. Ultimately, the appeal of the black Confederate narrative is a reflection of just how skewed and distorted our collective memory of the war has been and will likely continue to be in the coming decades. In 1914 these stories were of loyal slaves and now these same stories are of brave black Confederate soldiers. Both narratives depict African Americans as loyal to their masters and content with their position in society, but while African Americans may object to the former it should not surprise us that the latter is seen as more appealing by some. The appeal of these stories ought to remind us that truth is but one value in our individual and collective search for a meaningful past. Historians and others would do well to keep this in mind as we continue to explore the black Confederate narrative. I would never call H.K. Edgerton, Nelson Winbush, and Earl James(?) high profile African-Americans…. Agreed. I should have said, high profile within the context of this subject. I’m not sue I’d link Veronica Davis with Edgerton either, even by proximity. Calling for a scholarly review of that section to bring it in line with “accepted scholarship” strikes me as reasonable, and indeed overdue. It’s a long way from defending the passage as written. I completely agree, Ken. That was, indeed, a hastily written and sloppy sentence. There could be no black Confederate enlisted men as Confederate law strictly prohibited enrolment of blacks into southern service until early 1865 and then only a few companies were enrolled. Indeed there were many black slaves who followed their masters into service and who served the Confederacy well even to the point of taking up arms. Also ther were thousand that worked tirelessly constructing fortifications, however, they were simply contract workers whos wages were paid to their masters. As to the family of Weary Clyburn and Earl Ijames, it is my opinion that the SUV chooses to make public utterances of recognition of black Confederats with the sole purpose to reinforce their totally unsupported claim that 50,000 blacks fought for their cause. Your first sentence contradicts the second. If the the men in question were slaves than how is that they “served the Confederacy well”? By definition they were attached to their masters and served at his pleasure. That a few may have found themselves with a rifle at some point on a battlefield does not change their status; rather, it provides us with something to explain within the broader context of the master-slave relationship during the war. Thanks for the comment. Bob, the state of Tennessee enacted a law in June 1861 ‘allowing’ free men of color to enlist in the Army. The law also provided for their impressment if not enough enlisted. My own great-great grandfather was impressed into the Tennessee ‘Volunteers’ – he later lied his way out and moved to Kentucky where he joined the Union army. The law in question is on page 281. As far as I’ve been able to determine, Tennessee is the only state to have enacted such a law, but I’m still researching. While the tale of tens of thousands of Black Confederates is a myth, it is not true that no blacks served in the Confederate army. How many served willingly is another matter, and not one easily resolved. In paragraph two it was my intent to infer that a slave who went with his master as a body servant and as such did serve the Confederacy well. Not as a military man but in his role as a slave. I still don’t see how a slave “serve[d] the Confederacy well” given that he served his master. In other words, the slave was an extension of the master’s will. In addition, slaves were not citizens of the Confederacy. Perhaps you can explain how a slave “served” the Confederacy. Were there not situations where the Confederate government impressed slaves, whether their masters liked it or not? My understanding is that many, if not most of the Confederate trenches and field fortifications built just prior to and during the Atlanta campaign were built by slave laborers who were simply taken by the government from their masters’ plantations. Nice to hear from you. Yes, slaves were impressed by the Confederate government and used to build field fortifications. They were impressed as slaves and not as citizens of the government. Stephanie McCurry argues persuasively in her new book that the owners of slaves protested vigorously against this arguing that their property rights were being violated. My point is simply that we should be weary about characterizing their work in this context as anything other than what it was: slave labor. And congratulations on your book award. That is quite an honor. not make for accurate history. Kevin, thank you for that profound insight. I have been struggling for years to try and understand what possible reasons people have for perpetuating the Black Confederate myth, and that statement finally makes some sense of the issue. I worked with a White man who really believed in the Black Confederate Myth. BTW, he also bought intothe Obama-is-not-a-US-citizen Myth, too (hmmm… correlation?). Out of around 50+ people who work at my job, he was one of the few White people who worked there. I saw him again recently (we still sort of work together) and he expressed to me that he couldn’t believe he survived there as long as he did. I can’t remember the context of the conversation for his retrospection but I recall it had racial undertones.